I don’t consider myself to be a ‘hippy’ parent (whatever that really means), but I have found myself taking to some decidedly ‘crunchy’ parenting habits, including my penchant for cloth nappies, breastfeeding, baby led weaning and of course baby wearing. It’s currently International Baby Wearing Week, so it seemed appropriate to write a little about our baby wearing experience, and one of our favourite carriers. 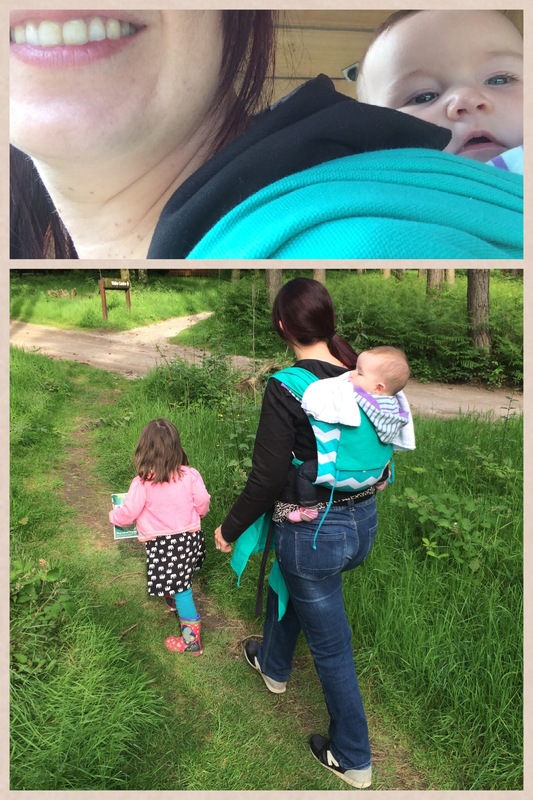 We started ‘baby wearing’ with G, first with a second hand high street carrier which was fine for a while but did get rather uncomfortable pretty quickly. We had a BabaSling for a while but never really got to grips with it, and then a pouch sling which we were sent by a relative in America which was actually really good until she got a bit heavy for it. When G decided she didn’t want to use a pram any more we resorted to quite literally carrying her when she was fed up of walking, and as I’d not discovered woven wraps or toddler carriers, I ended up using a HippyChick hip seat – a genius invention until said toddler decides to use her own legs for a change, and leaves you walking around wearing what looks like a slightly bizarre bum bag. This time round I was keen to find something more practical and, dare I say, a bit more stylish. Not knowing exactly what we wanted I headed for a local sling library. We’re lucky around here to have an abundance of sling libraries where you can try out different types of carriers for a small fee. It’s well worth doing if you’re interested in trying a carrier out, as they aren’t particularly cheap (though they can be brought ‘preloved’ and they do hold their value very well for resale). And so since C was born I’ve used pretty much most types of carrier – a stretchy Moby wrap, Connecta, half buckle, woven wraps, an ABC (Action Baby Carrier), ring slings and mei tais. I like using a carrier largely for simplicity – we live so close to the school that by the time I’ve got the pram out and C appropriately dressed and strapped in for the school run we could be there already, plus the rigmarole of reversing the procedure ten minutes later! 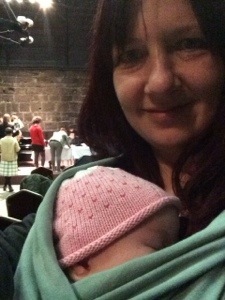 And I have to admit to really enjoying carrying C – the interaction you get when carrying is far stronger than we would get in the pram, and she’s more content and alert, able to see more around her and interact with more people on the way. Despite trying so many slings there was one type I really fancied but which I couldn’t find anywhere. An Onbu, or Onbuhimo, is a traditional Japanese carrier. It’s similar to a mei tai in that it has a fabric body and fabric straps to tie into place , but instead of a waist strap it has a ring on each side which the straps pass through. It means a little less tying than a mei tai, also you can put it on whilst holding baby, you don’t need to put them down first. You can even tie it ‘on the go’ if, like me, you’re constantly late for the school run! With none around for me to try, I happened to stumble upon some tutorials online for making mei tais, and it occurred to me that an onbu should be just as easy. I didn’t take step by step pictures and to be honest kind of made it up as I went along so I’m not going to post a full tutorial – I used a few different existing tutorials as a guide including this one and this one, although I used an existing carrier as a template and went a bit overboard on making sure it was strong enough to carry the weight! I’ve used it now for probably about 6 months, both front and back carrying – for the school run, woodland walks, trips round the shops and even just to get the washing done at home. And I love it! I don’t really know why they’re not seen very much over here but they definitely should be. The biggest plus for me is the speed of using it for a back carry. I pop it on the bed/grass/seat of the car with the straps already threaded through the rings, lie C on top, tuck her legs through and use a ‘superman toss’ to lift her onto my back. From there you just slip your arms through the straps like a rucksack, pull tight and tie the straps together in front. Voila! One day I might brave making a video to show you what I mean, and quite how easy it is. 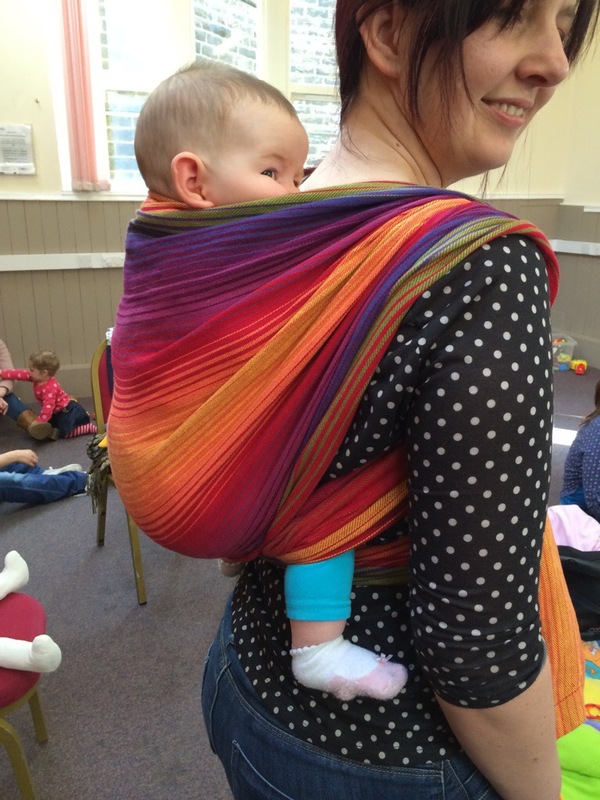 Whilst I’ve grown to love my woven wrap, I’ve not perfected back carries with it so the Onbu is still a fail safe favourite for me and I’m hoping it will last us some time! It’s official, I’ve become one of those mums. Yup, I’m a card carrying member of the breastfeeding, cloth bumming, baby wearing brigade. And I’ll probably end up doing some form of baby led weaning too, just to complete the picture. An eco mum, you could say. Except I’ve got a confession. It’s got very little to do with being eco friendly. In fact, I’m doing it all out of pure laziness, with a bit of vanity thrown in. Breastfeeding – C seems to have a cows milk protein intolerance, which rules out standard cows milk based formula. I’m not entirely surprised as I struggle with dairy too (it gives me migraines and headaches). I could get a special formula on prescription, but that would involve firstly the faff of going back and forwards to the docs to get it, not to mention the faff of washing, sterilising and making up bottles constantly. And apparently it stinks anyway. I’m grateful that I can breastfeed (not all can), so for me breastfeeding just seems easier overall. Even if I can’t have cake. Cloth bumming – the one household chore I hate more than anything is taking the bins out. I’d much rather load and unload the washing machine every other day than trudge out with a heavy bag full of pooey nappies. And the cloth nappies these days are seriously cute – I’ve already got tons of girls clothes left over from G so don’t have much excuse to go cute shopping otherwise. Baby led weaning – we’re not there yet and won’t be for another few months. But seriously, cooking, blending and feeding all those purees? Who’s got time for that? And I tasted some of those baby food jars when G was weaning – yuck! Nope, C can have (broadly) what we’re having 90% of the time and leave it at that. They might not be the reason that the books give for doing all of these things, and it might only be me that sees it this way, but it’s what works for me. And surely that’s the only thing any parent should be striving to do – bring up their children in a way that suits their personalities, lifestyle, morals and so on? Having done this all before, I should probably know all there is to know about newborns, but the truth is I’d totally forgotten 90% of what was useful first time around. So in an effort to be helpful to others, here’s my round up of the five most useful products for the early days of having baby at home. There’s nothing worse than trying to put on / take off layers of clothing on a squirmy newborn baby. And once they’re asleep the last thing you want is to be waking them up worried they’re too hot or too cold. Not to mention the fact that padded coats and snow suits are a big safety risk in car seats. The Morrck hoodie slips onto your car seat or pushchair, with straps to safely use with a three or five point harness, and means you can quickly and easily adjust the number of layers over baby without disturbing them, or dropping blankets on the floor. It’s brilliant for nipping in and out of shops and shopping centres, and has enough layers to keep baby cosy even if it’s snowing outside. Newborns like to be with you as much as possible, and who can really blame them? They’ve spent 9 months growing inside you, sheltered from noise, temperature and hunger, then suddenly are thrust into a bright , noisy and downright terrifying world. Before you feel as though you will never get a moment to do anything for yourself ever again, a sling can be a really worthwhile purchase, and the Moby Wrap is a popular choice both for ease of use and flexibility to use with different holds etc – I’ve only just started using it but already much prefer it to my previous ring sling, which never seemed particularly comfortable for baby. It takes a little getting used to when tying it on, but there are plenty of YouTube videos to show you how,and once tied you can leave it on you until you’re ready to put baby in, even putting the wrap on yourself before getting in the car for example, or keeping it on all day and popping baby in and out as required. If you’re going to breastfeed, this is pretty much the only product worth buying! With all the talk of how natural and easy breast feeding is, it can be a surprise how uncomfortable it can be at first, and Lansinoh is basically like a magic balm to help! The only annoying thing is how difficult it is to get out of the tube if it’s not been warmed up a bit first. I should add that whilst it can be uncomfortable at first, breast feeding shouldn’t be painful, and pain is usually a sign of a poor latch. There’s lots of support out there either via your midwife or organisations such as the NCT and La Leche League, both of whom have helplines and breastfeeding supporters who will even come out to visit you in person, either at home or in hospital. 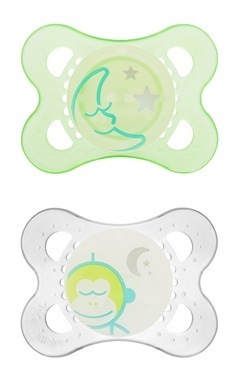 Now I’m not saying that dummies per se are an essential baby purchase, but if you do decide to use a dummy with your baby, these are genius – once you get over the slight weirdness of offering your baby something green and luminescent, that is. Why are they so useful? Well, after a few nights of minimum sleep, even the seemingly innocuous task of fishing a dummy out of a Moses basket becomes surprisingly onerous, so the soft glow of these soothers suddenly becomes incredibly useful! Not strictly for baby, but when you have an older sibling to think about, getting them on side early on is a no brainer! 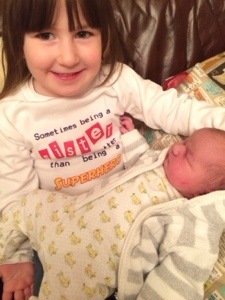 With G currently obsessed with superheroes, we put in a special request for a RockItTots T-shirt saying “Sometimes being a sister is even better than being a superhero”, and gave it to her as a present from baby C when she first visited her in the hospital. RockItTots were more than happy to oblige and it was dispatched quickly, so was here in plenty of time for the (admittedly late) arrival of baby C.
So there you go – my five favourite products for baby, all of which are very much in use with C, who’s now ten whole days old! All of these products were either bought with our own hard earned cash or given to us by friends, we haven’t been given anything for free or paid / otherwise encouraged to review them!